A suspended chandelier has delicate openwork, and it's possible to turn on the electric light bulb in chandelier. A Ferris wheel is made to rotate with electric motor. 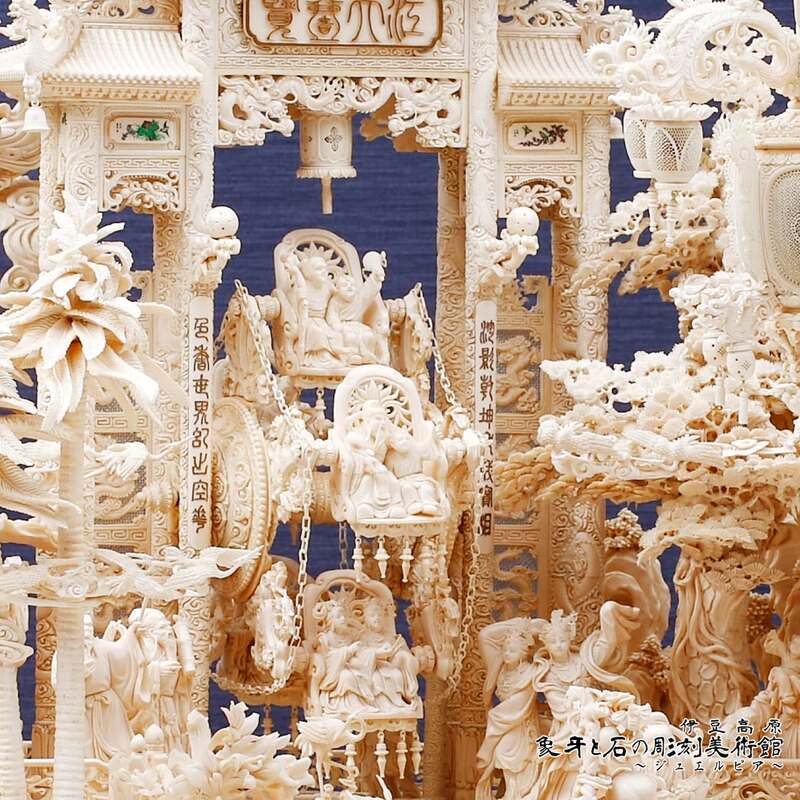 75 gods are carved, and front-side is carved bigger than back-side to feel more depth. 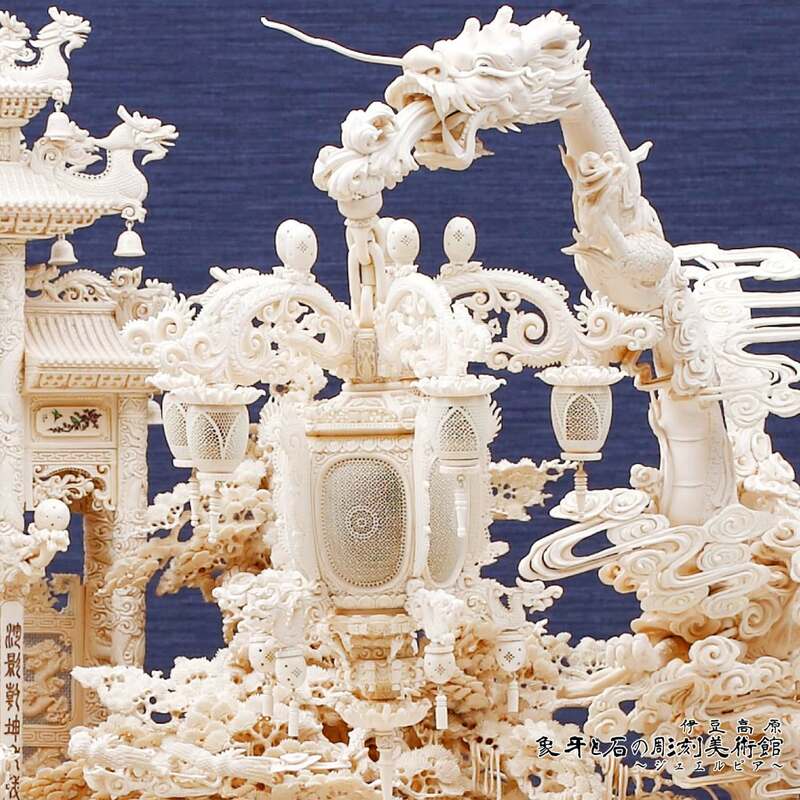 Zero-point perspective is used on this art-work. All windows are capable of opening and closing on the houseboat. Even a table and a chandelier are provided in the room. 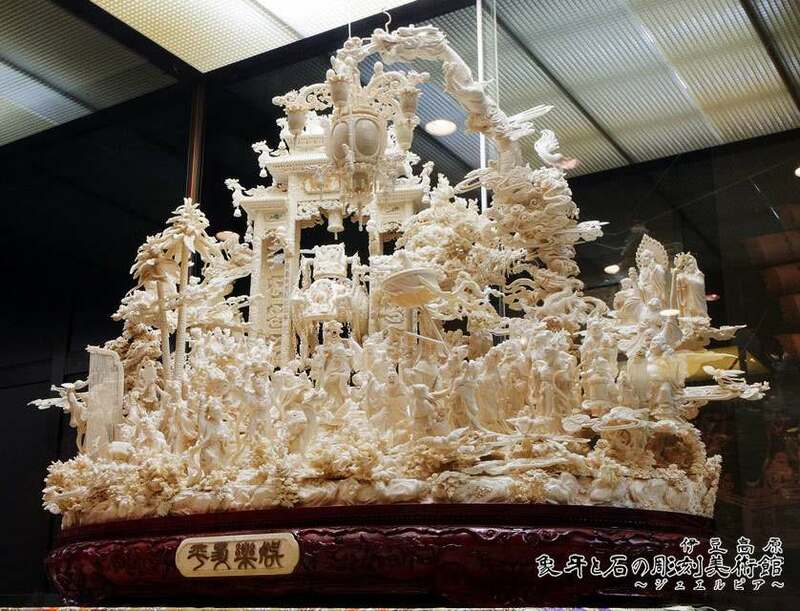 It's also made delicately at the place which isn't seen. 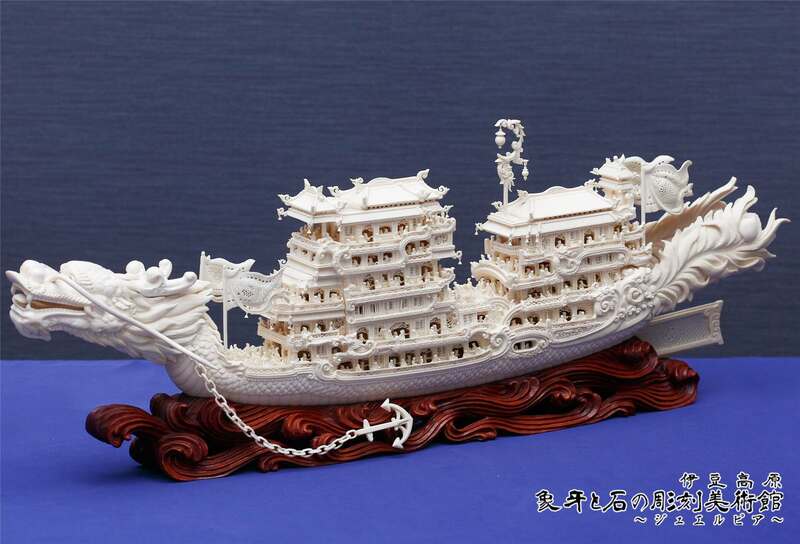 Delicate sculpturing is done to the small person who is on the ship and the person who reads a book and the person who holds a child. 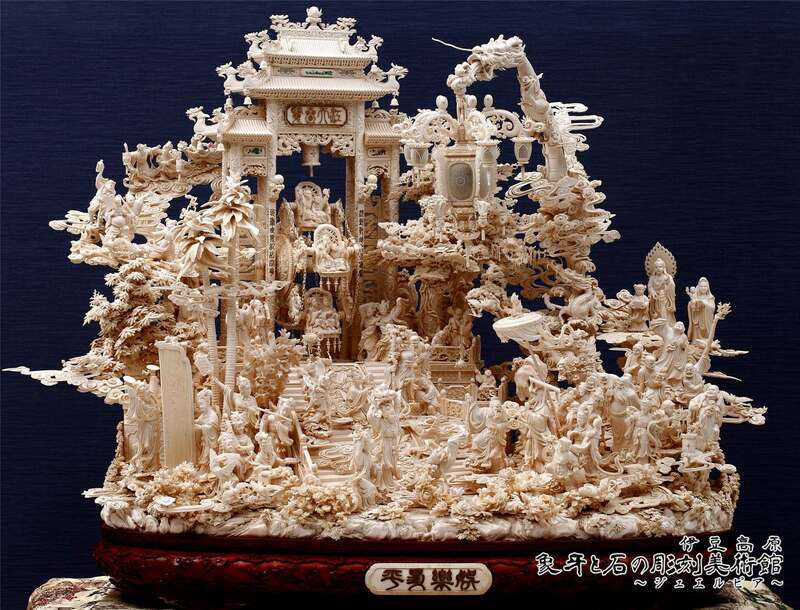 it's showing the various scenes. 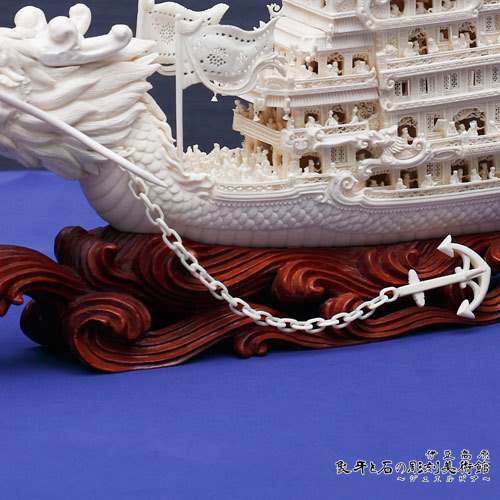 A beautiful and delicate openwork is done to a helm of the ship. 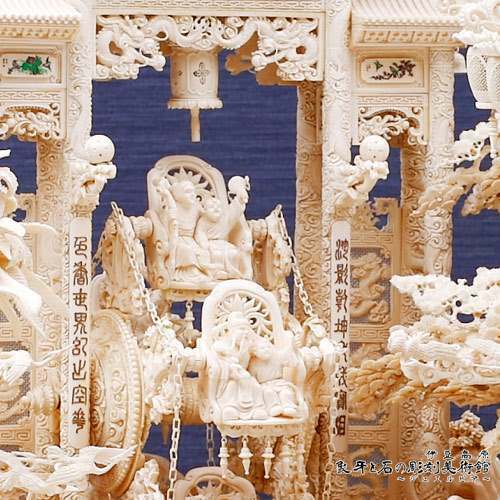 The chain which connects from a neck of a dragon is carved from one piece of ivory, and there are no joints at all. Person's expression is expressed very abundantly. 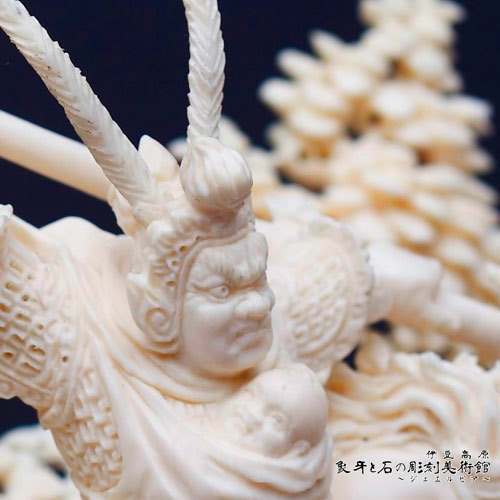 Surprise can't be hidden in a gentle smile of Liu Shan(baby) Zhao Yun holds. 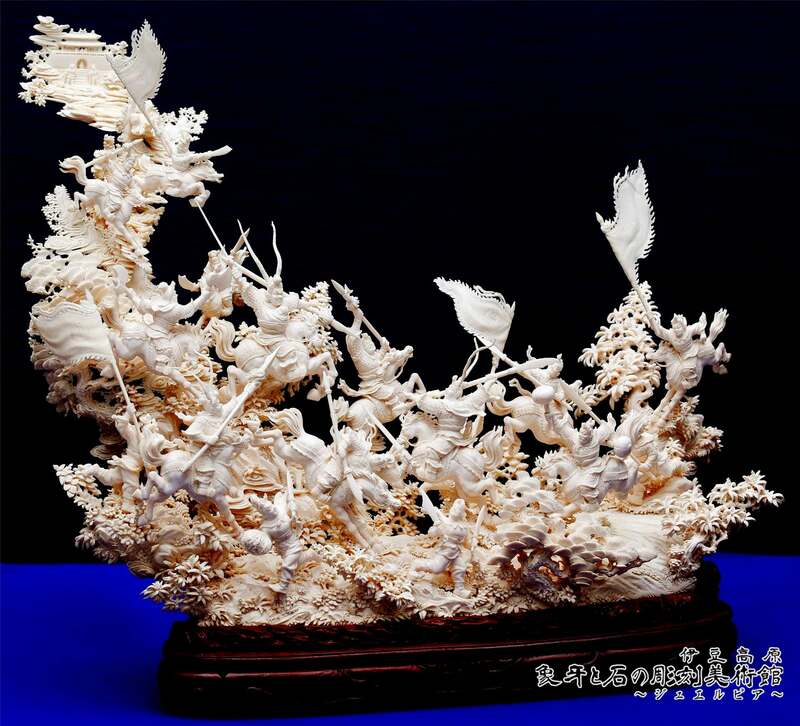 A stage is Battle of Changban from Sanguozhi. The situation Zhao yun runs through Cao Cao army by only himself and rescued seignior's legitimate son "A Dou(Liu Shan)". 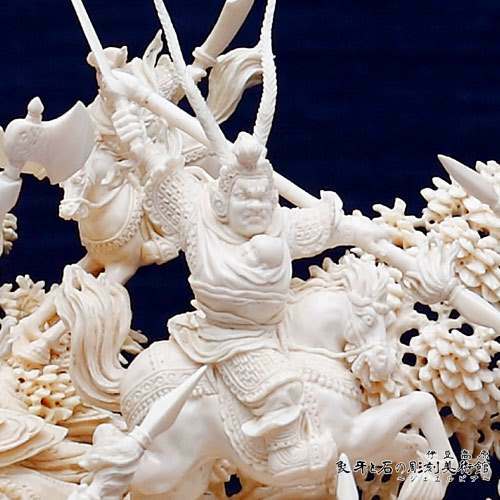 The face of Zhao yun, general's of Cao Cao army are expressed dramatically done. All layers are separated and rotatable. Spheres are very smoothly polished so that if you blow it with air, it rotates. Delicate openworks are also given to all inside layers. 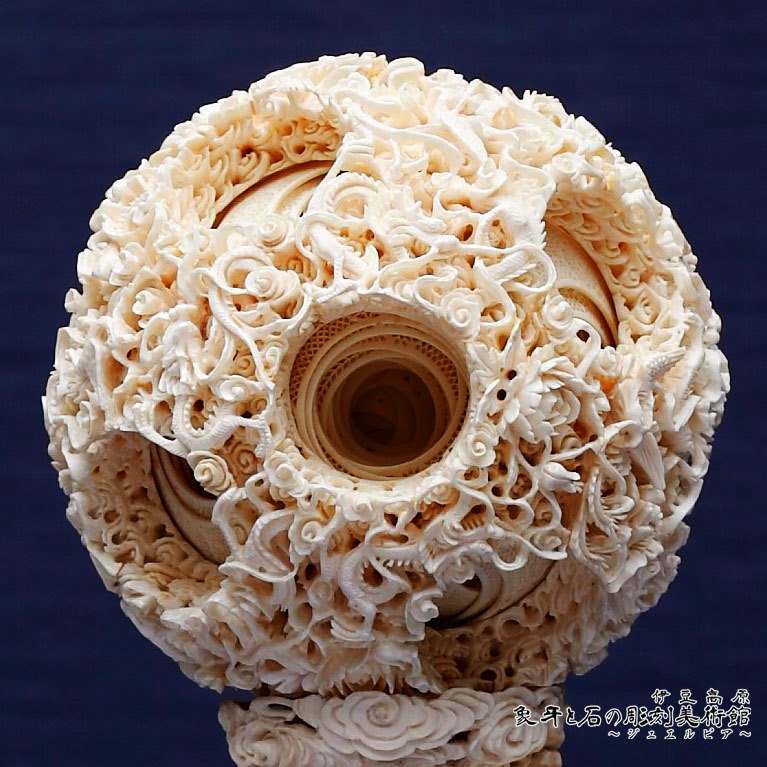 Production method: Make conical holes in a ball of ivory. From the conical hole, Insert a thin carving tool and cut off layers and then carve openworks from the outside. Due to the hand work, the one which exceeds 20 layers would take life time of a craftsman or even second generation of his for producing it. 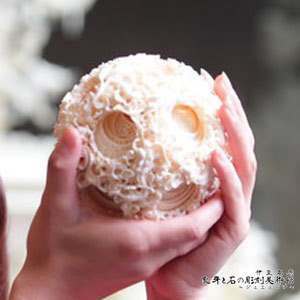 A work beyond 50 layers, the size of the sphere is surprising, but also the works of it. 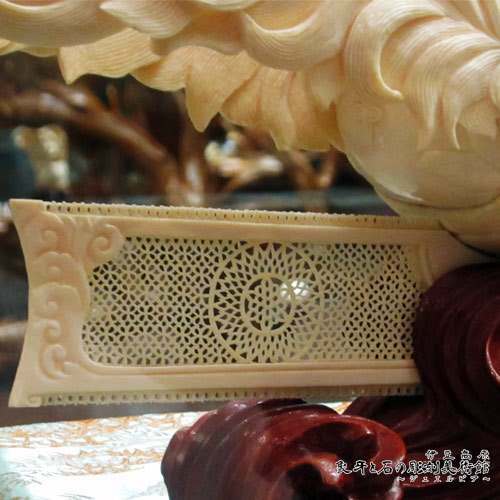 Every layers has openwork neatly. 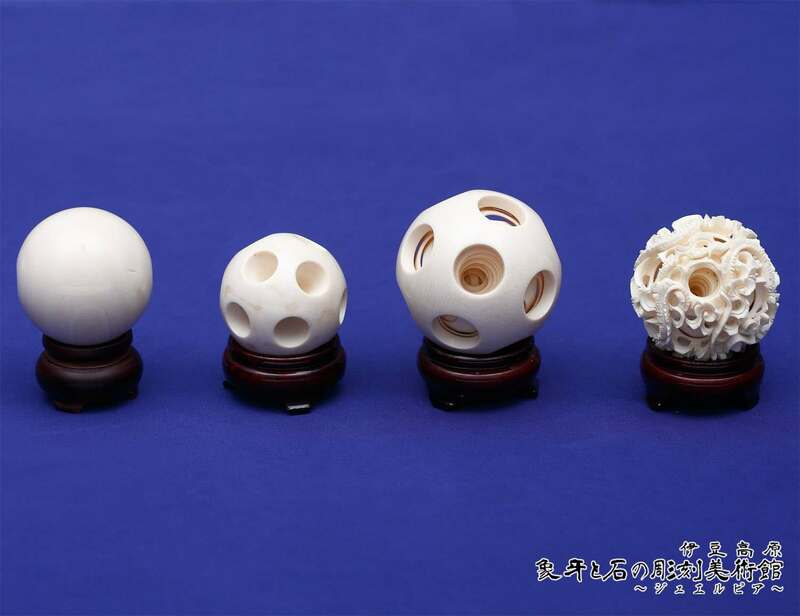 Ivory carved balls in presentation case. 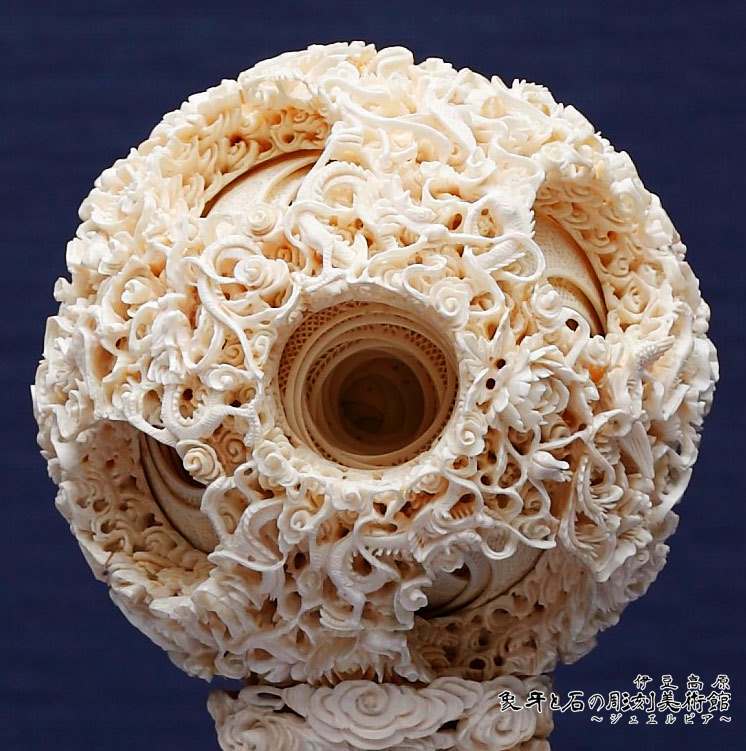 There are 30 layers, 40 layers and 50 layers in carved balls. a thurible of Ivory carved balls and the production process of the Ivory carved ball are also exhibited. Ivory was also valued highly more than ancient times in China. 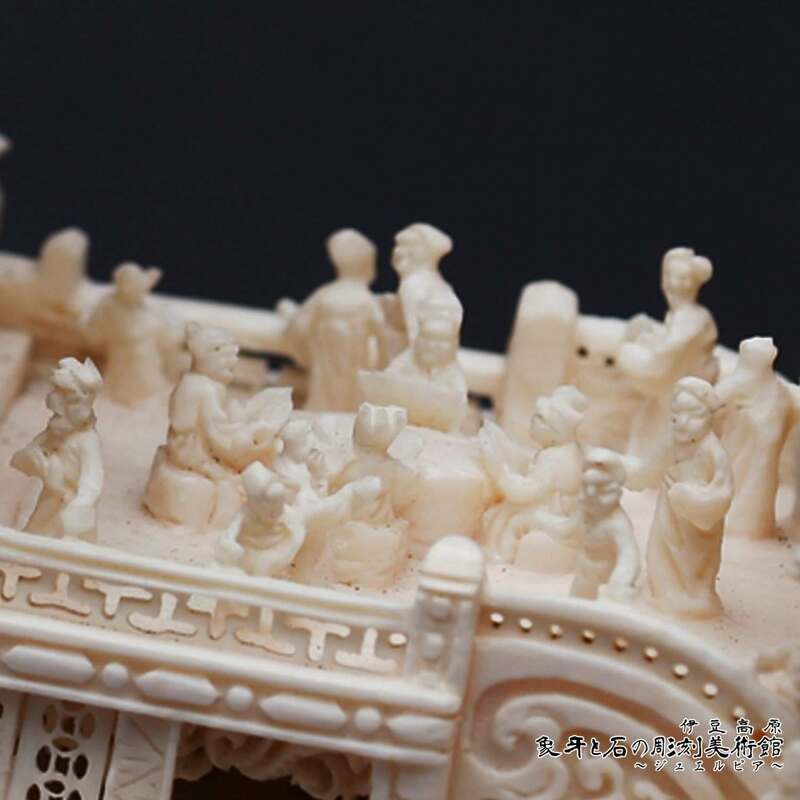 The ivory was made presentation items to Imperial Household for many times. 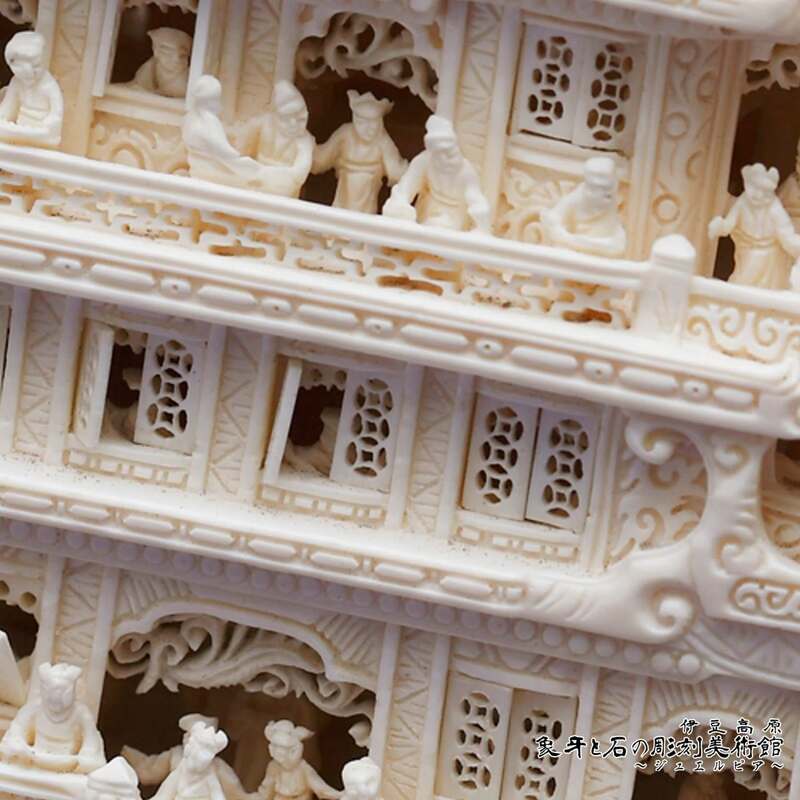 After Ming dynasty and the Qing dynasty, Craftsman of ivory carving succeeded a traditional technique, also created newer technology for completing wonderful works. 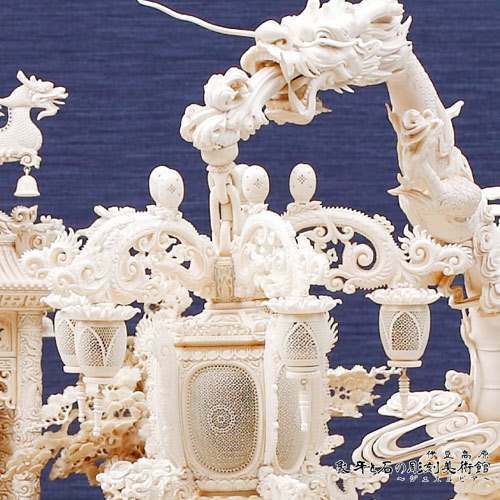 the technique of solid carving,relies,openwork takes one's eyes for its expressive power. 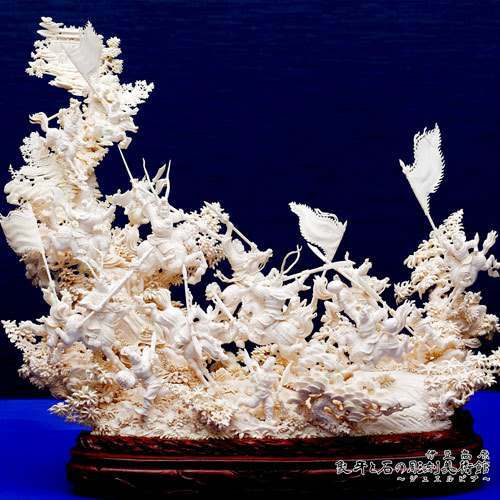 There is a feature such as elegant modeling, the splendid decoration and forcefulness of the profile. 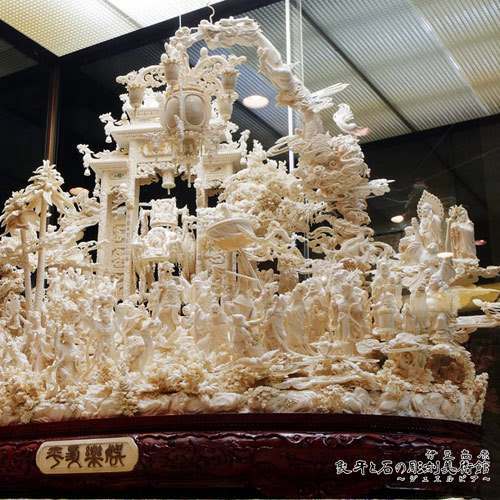 Ivory carvers split up into 2 parties as Chiangnan party and a Cantonese party in Quing age. The work a craftsman of Chiangnan party made floods an uplifting feeling by a novel relief, and a minute sculpture receives high evaluation for a work of a Cantonese party. 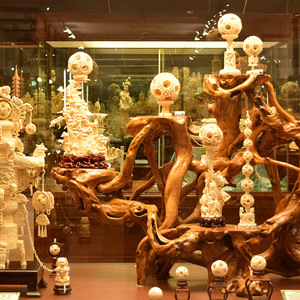 Many of exhibited works in this museum are based on Chinese classical literature and lucky charm for one's longevity, Fukujiyu(long life and happiness) and heaven (gods) etc.